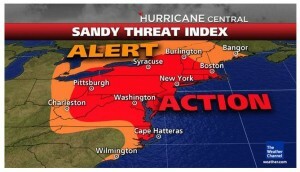 With Hurricane Sandy bearing down on the northeast United States, the potential is high for cybercrooks to release a wave of scams and malware related to the storm. If the past repeats itself, Facebook postings, tweets, emails, and websites claiming to have exclusive video or pleading for donations for disaster relief efforts will appear shortly after the storm hits. These messages often include malicious code that attempt to infect computers with viruses, spyware, or Trojan horses. After hurricanes Katrina and Rita hit the Gulf Coast in 2005, the FBI, the Justice Department, and the Federal Trade Commission formed the Hurricane Katrina Fraud Task Force to battle the massive surge of scams that came with it. The American Red Cross reported at least 15 fake websites that were designed to look like legitimate Red Cross appeals for donations to relief efforts. These actually proved to be phishing attacks, which directed users to a malicious server that collected credit card numbers, PayPal passwords and other personal information. When donating, make sure you donate directly to reputable charitable organizations. Ask for a physical address and a phone number of the charity - if the charity is authentic, they will willingly give you this information. As always, do not respond to an unsolicited email of any sort.